Villa Cortes Retreat Center provides three colorful houses that are strategically set in the intricately landscaped garden that allows its guests to stay close to the nature. It features an outdoor, multi-purpose pavilion and 20 meter infinity edge pool. These houses can be rented individually or all together. You will find all the houses unique in design and decoration. 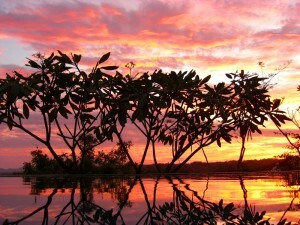 Each o the house is decorated with bright color that easily fits into the laid back “Pura Vida” environment of Nosara. These houses are absolutely perfect for enjoying family getaway and also ideal for groups of up to 17 people traveling on specific retreats. 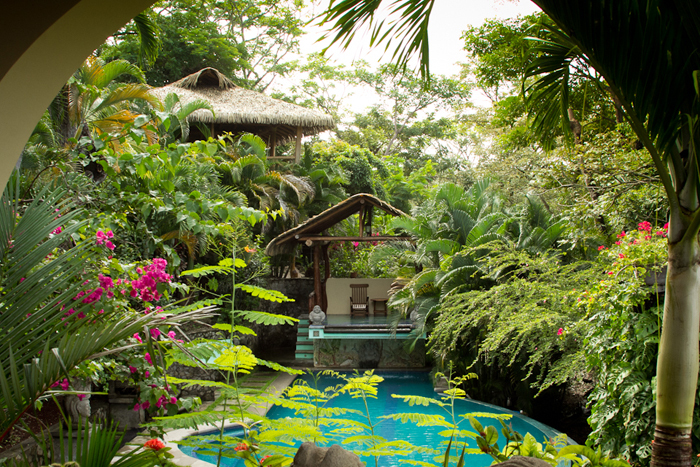 During the vacation at the Villa Cortes Retreat Center, You will enjoy spending some tranquil time by watching the beautiful colorful birds and monkeys while sampling the many tropical fruits and flowers that surround the property. It is the largest house with festive decor and features two private porches. Surrounded by gardens and wildlife, this casa is ideal for those who want to enjoy a memorable vacation with a large group. This Casa has a master bedroom with large glass wall through which you can enjoy watching the amazing view of the area and also can spot monkeys playing in the mango trees. This house has the capacity to hold 4 to 9 people and it is featured with 4 twins (or two king-sized beds), 2 sets bunk beds, 1 day bed, 2 full baths (one with shower, one with two-person tub). There are also ceiling fan, full kitchen, outdoor shower, air conditioner, garden views, beach path, grill, organic sheets, hammock area and also Wi-Fi connection. Made around a coconut palm using responsibly harvested plantation teak, this casa offers warm and natural environment. This casa provides colorful bedding and also feature an open floor plan that gives the room environment a tropical touch. There is elevated porch ideal for spending some tranquil time and enjoy watching stunning views of ocean and garden. This Casa has the capacity to accommodate 3 people. This casa is equipped with 3 beds – 1 full, 1 single, 1 daybed, 1 bath with garden shower, kitchenette, air conditioner, TV, ceiling fan, Wi-fi, hammock area, grill and also organic sheets. This is the original house of the property. Ideally designed for accommodating 4 people this casa is featured with an open floor plan and large kitchen for entertaining. You can enjoy some tranquil time at the wrap-around porch as well as enjoy watching amazing sunset views, lounging in the Balu bed with cool ocean breezes and dining by candlelight. In this Casa you will get 4 beds – 1 king, 1 single, 1 sofa bed (single), bath with shower and double vanity. There is also outdoor shower, TV with DVDs, air conditioner, Grill, beach path, organic sheets and hammock area. Villa Cortes Retreat Center provides an open-air multipurpose outdoor pavilion. This pavilion has 400 square foot area. For the construction of this pavilion, local exotic hardwood is used. Nestled high above the pool and gardens, this pavilion is perfect for practicing Yoga or meditation. At the time of practicing your workouts, you can also enjoy watching the amazing ocean view. 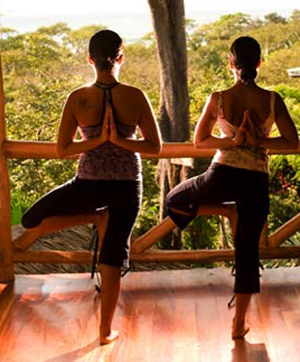 This center offers yoga retreats all around the year and all the classes are guided by experienced instructors.